…of Title DropDownList on a ASP.NET Web Page. We will discuss the technique to populate one ASP.NET DropDownList with the Dynamics CRM OptionSet Items. It is very natural that on a Registration page, we require the Title of the person getting registered. 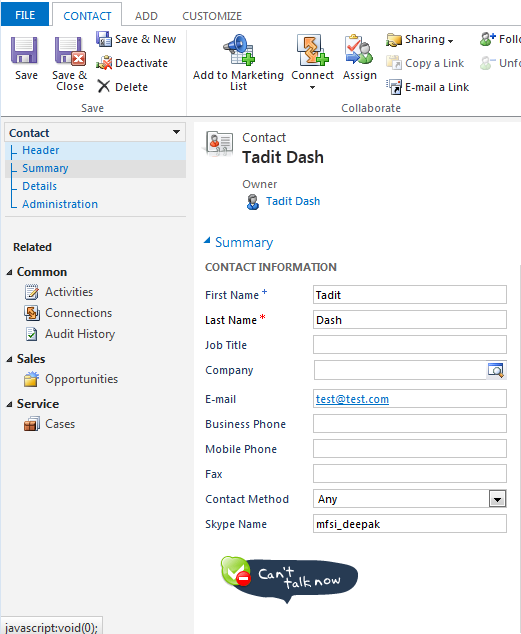 The Title was a OptionSet field in CRM Contact Entity. So, I found a way to fetch all the Title OptionSet items and then binding it to the Title DropDownList. Now, let’s discuss the Code. The following function takes Entity Name and OptionSet Attribute Name and returns the ListItemCollection, which is a collection of ListItem (Text and Value). I have generalized this as a function, so that it can be reused every time we need to bind OptionSet to a DropDownList. Code is explained more by inline comments. /// This method is used to fetch the Option Set Items (Value and Text). // Create the Attribute Request. // Get the Response and MetaData. Then convert to Option MetaData Array. // Add each item in OptionMetadata array to the ListItemCollection object. Now it is just a matter of calling the function and binding it to the DropDownList. 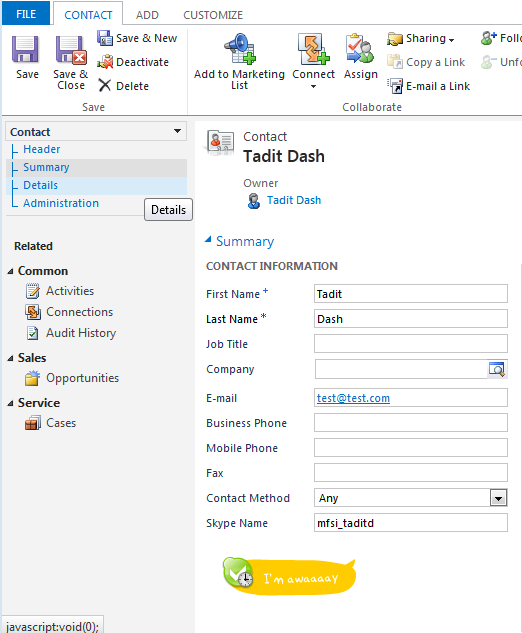 // in Contact Entity of CRM and then bind the Options to DropDownList. Last, but not the least. We have to declare DataTextField and DataValueField properties of DropDownList in aspx MarkUp, so that it will bind the Text and Value from the DataSource. Otherwise, it will bind the OptionSet Text to DropDownList Text and Value properties both. Let’s see how exactly it binds the Text and Value to the DropDownList by referring its Source HTML in browser. If you find this Blog as helpful, then please Like and Share among your Friends and Colleagues and add some Comments. It really means a lot. That will also help to fine-tune my technical skills. Hope you enjoyed reading the Blog. 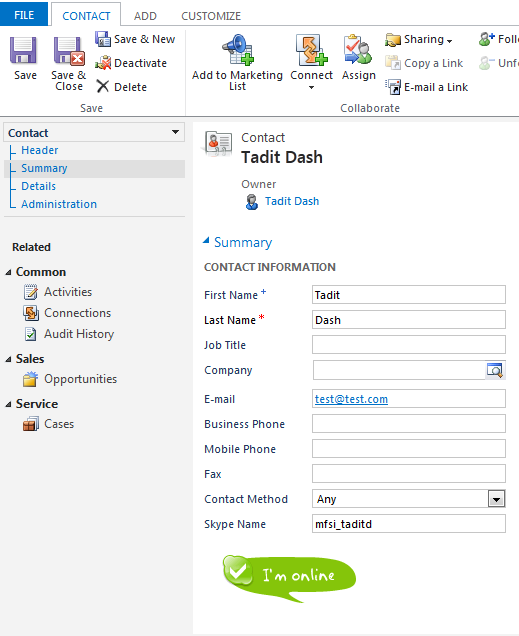 Let’s discuss the technique, by which we can easily integrate the Skype Status in our CRM Form. We will show the Skype Status in Contact Form. Indicates that, it will invoke the Skype Client. Refer Figure– Skype Prompt Box below. After you click on “Skype” App in that dialog, it will open Skype dialog for user “mfsi_taditd” (Figure– Skype Client Invoked). loads the Skype Status Image of user. How will we implement this in CRM Form? We will simply generate an Anchor and Image tag combination dynamically according to the entered Skype Name and populate that inside a Div. Thus, it will render the Skype Status of user. Now, add one WebResource in Contact Form just below the Skype Name Field and select SkypeStatus.html as the WebResource file in that WebResource Properties Window. See the following image. 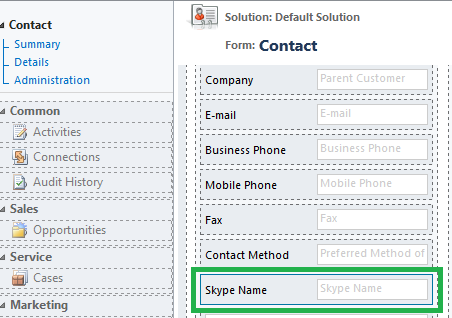 The HTML file will show the Skype Status Image dynamically according to the Skype Name entered in the Skype Name Field (Described at Step-1). The code of HTML page is described below. This function is responsible for creating and populating the Div (divSkypeAnchor) with the required Anchor and Image tag combination. We are going to explore more about it in the next Step. 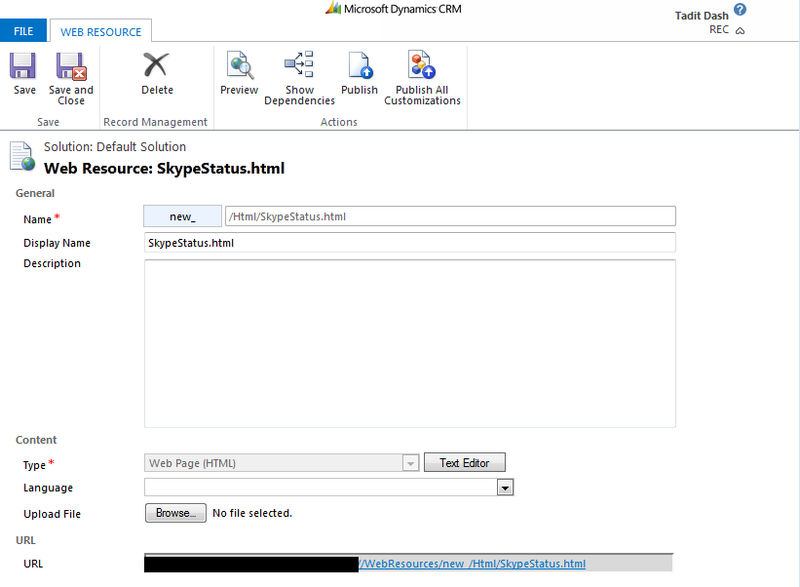 /// This method dynamically populates the Skype Status Div. // If Xrm is present. // Get the Skype Div. // If Xrm is obtained from parent page. // Get the Skype Name (new_skypename) of the Contact from page. 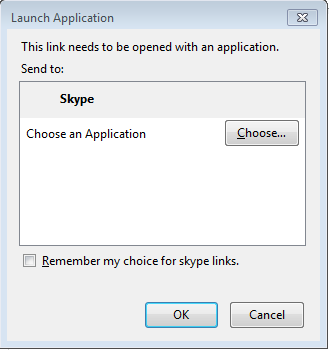 // Create the Anchor and Image combination using the "skypeName"
// Assign the "skypeAnchor" to the Skype Div. 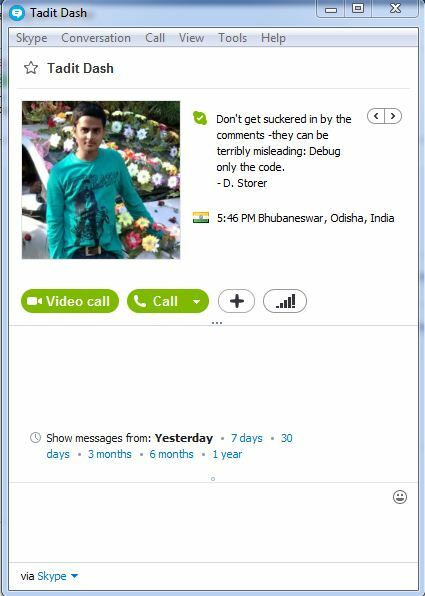 In the function, the main aim is to assign the Anchor and Image tag combination along with the Skype Name to the Div (divSkypeAnchor). Let’s divide the function to two parts. The Contact Form is the Parent Form and the Div present inside the WebResource, is rendered as Child iFrame. As the Skype Div (divSkypeAnchor) is present inside the iFrame, if we will access it using document object, then the document should refer to the iFrame (WebResource) and not the Parent Contact Form. , then document should be the WebResource (iFrame). As this function will be called both on Form Load and Skype Field onChange Events, we need to make sure that document refers to the Child iFrame in both cases. The argument isXrm is used to recognize whether the request comes from the HTML WebResource (Form Load Event) or the Parent Page (Skype Field onChange Events). Let’s discuss the way, by which, we will assign value to Skype Div (divSkypeAnchor) during these events. 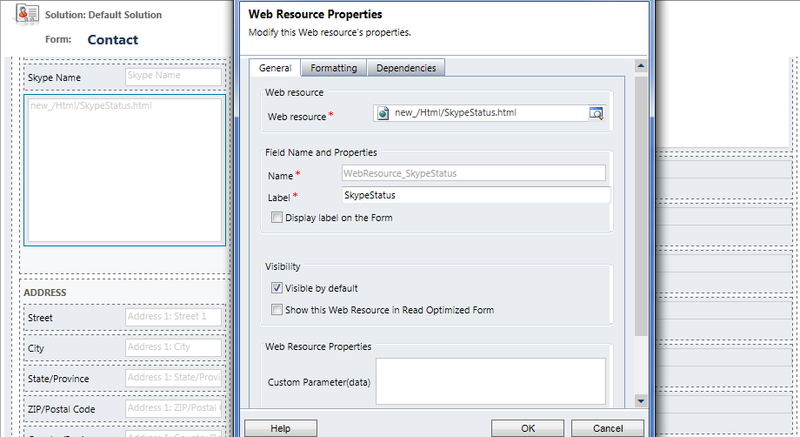 On Form Load, it will load the HTML WebResource and on the WebResource load, we have called the method like below. More about the WebResource at Step-2. As the function is called inside the HTML WebResource, so we can directly get the Div (divSkypeAnchor) from document (as it refers to the iFrame document). The main issue here is, we can’t get the Skype Div (divSkypeAnchor) directly from the document (as it will refer to the Parent Contact page). This is because the event executes on Skype Name Field onChange of Parent Contact Page. To indicate that the request is going from Contact Form, we are passing isXrm as true. More at Step-4. , which refers to the iFrame Document. Now problem is solved. Using the innerDoc, we can now get the Div (divSkypeAnchor). This page variable is determined by isXrm parameter as we discussed in Part-1. Using the skypeName, the skypeAnchor (Described at Mystery behind Skype Status) is created and assigned to divSkypeAnchor in the next line. Go to Contact Form Properties. 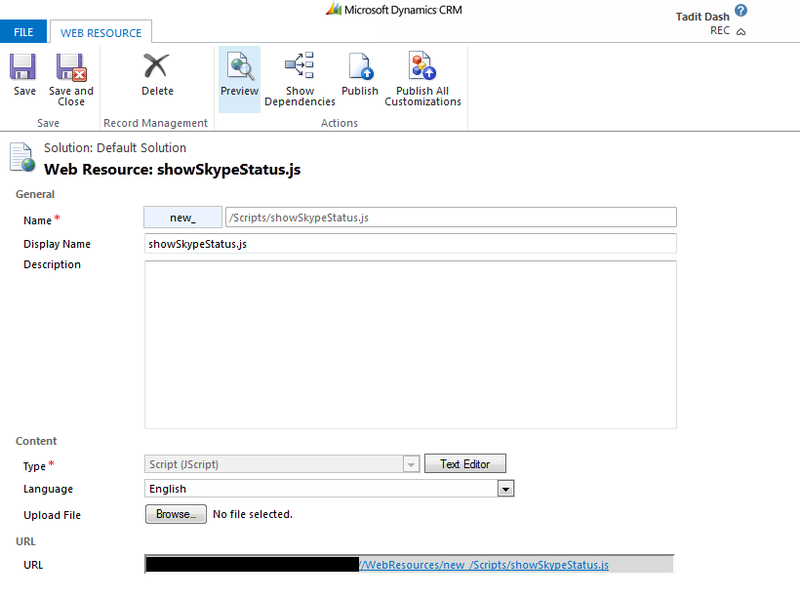 Add showSkypeStatus.js in Form Libraries Section and Skype Name onChange Handler in Event Handlers Section. 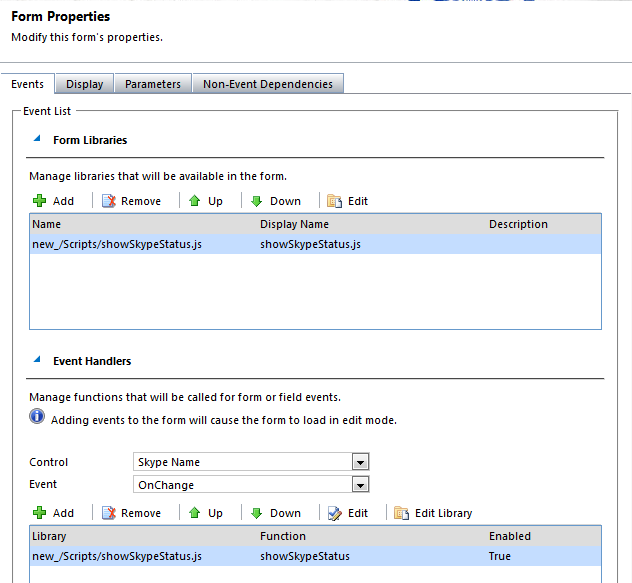 The Event Handler Properties is shown below. 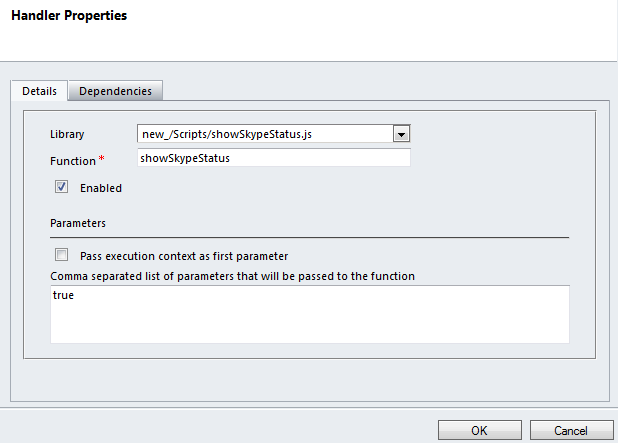 Note that function here is showSkypeStatus and parameter passed is true for isXrm. (Described at here). Are you Away or Busy? Check how it shows the Status on the Contact Form.